With Thanksgiving and America’s annual turkey cull today, G10 trading was subdued. However with the relentless March of US Yields emerging Asia FX remains under severe pressure even as money continues to flood into select equity markets and industrial commodities. These are strange times indeed. Instead of gently rolling into what will be for many, a long weekend in the USA, New York trading saw a frenzied rush yet again into USD against G10’s and another march higher in bonds with US 10 Year yields touching 2.40%. USD/JPY, in particular, continues to love the yield differential and the fact there is zero chance Mr Trump will label them a currency manipulator, trading to just 112.85 in New York and Asia trading. AUD/USD remains marooned at 7375, caught as it is, in the crossfire between surging US yields and surging industrial metals and coal prices. The dislocations in the market continue to be more painful than the one I suffered from on the rugby paddock a few years ago. Bond yields keep climbing globally but so do equities. As do copper, iron ore, thermal coal, zinc, etc. from the industrial commodities gang. Dalian iron ore was up 5% today and LME copper futures are trading up 3%. I very much doubt that Mr Trump will be buying all of his copper and steel from China once he gets his New Deal programme underway and not in the amounts China have consumed in the last 20 years. I don’t often agree with economists, but the USD, US Yields, global equities and global industrial metals can’t all go up at the same time in a globally low inflation environment. The decoupling, when it happens, as it must, will be quite emotional movements wise me thinks. Two things that are following the playbook are FX and in particular emerging market FX and gold and silver. Gold has cracked the psychological $1200 and ounce level which could imply a move now to the $1150 level if the USD says bid. Emerging FX is also under the hammer, particularly in this region today. USD/PHP has traded to 50 Pesos today although their stock exchange has followed the playbook and sunk this month. USD/MYR touched 4.4600 before drifting back. Both the Reserve Bank of India and the PBOC were both seen intervening apparently selling dollars. Continuing to defy forecasts as the yield differential sees a stampede by Japanese investors for US bonds. Breaking above 113.00 as I type. Resistance lies at 114.40 but I would expect there to be exporter offers and options barriers at 50 tick increments from here. 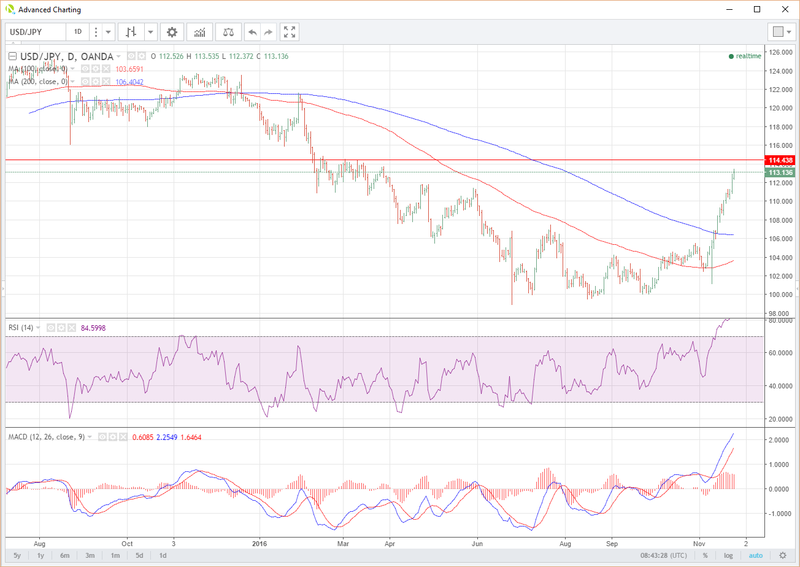 I also note that the daily RSI is now seriously overbought. A weakening JPY is clearly being seen as a boon for Japanese exporters and rightly so. The nNikkei continues to plough now higher following the USD/JPY and US Indexes higher. 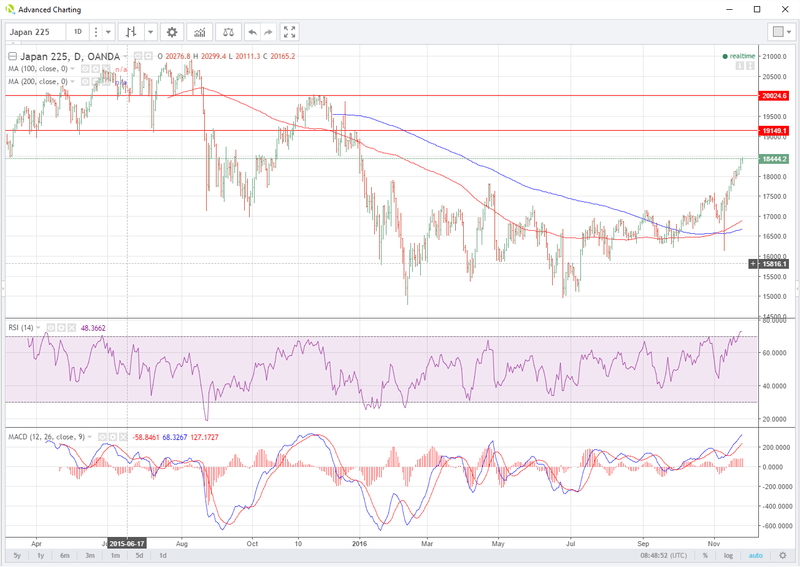 Minor resistance is seen at 19150 but the real level is around 20000. I note again that the RSI is very over-bought. The monthly chart gives us a better picture here. 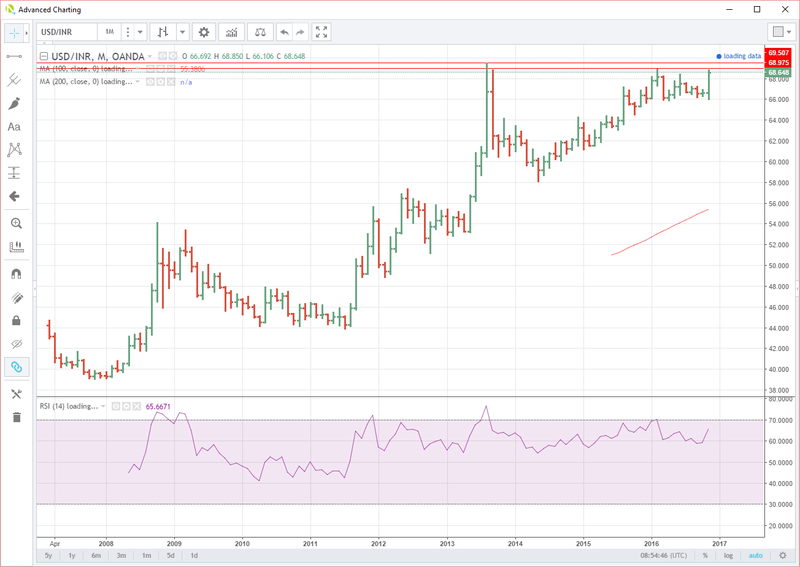 USD/INR touched monthly resistance and near record highs of 68.95 today.All eyes will be on the 69.50 level the all-time high. With speculation about impending restrictions on gold imports, INR may get some relief. However, India is a model country for the effects of high USD yields making their financing more expensive and also raising imported inflation. 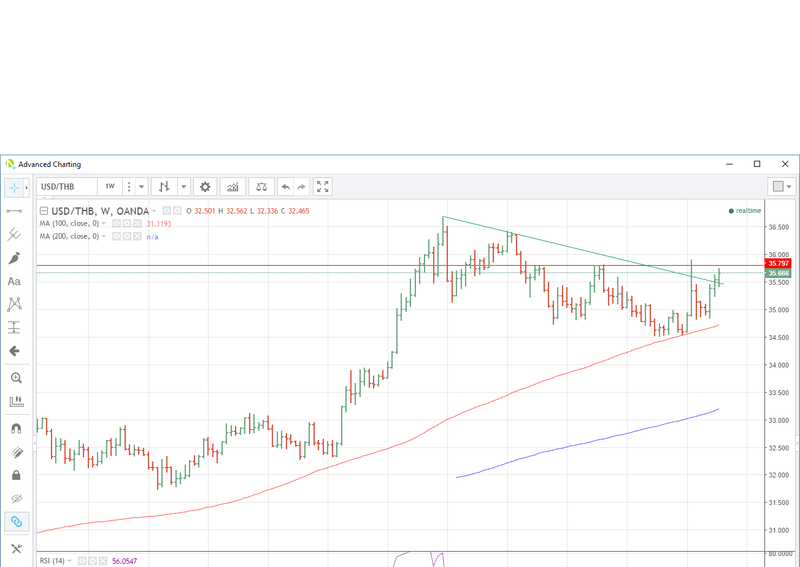 The weekly chart on USD/THB shows a break of long term resistance at 35.478. (The previous spike being the reaction over the King’s death) Thailand is not in such a tough corner as India in that it has a substantial current account surplus as opposed to a deficit. However, it will not be immune to the effects of imported inflation going forward. Weekly resistance is at 35.800. As US yields rise the attraction of emerging markets fades. This is a two-pronged cause. Firstly as US yields rise the differential to Asia fades. Secondly, a rising cost of financing and weakening currency tends to make investor hot money run for the door. Emerging markets with large USD offshore borrowings and current account deficits to finance are in the worst position. But it is not all bad news as countries with floating currencies and export facing markets to the USA such as Japan, continue to see their equity markets buck the regional trend.